This mini vegan french silk pie is crustless and made in a 5-inch springform pan, making it the perfect dessert for 2 to 4 people. Or perhaps a ravenous 1 could take it down without a problem if it’s been a rough week. Crazier things have happened in our household. 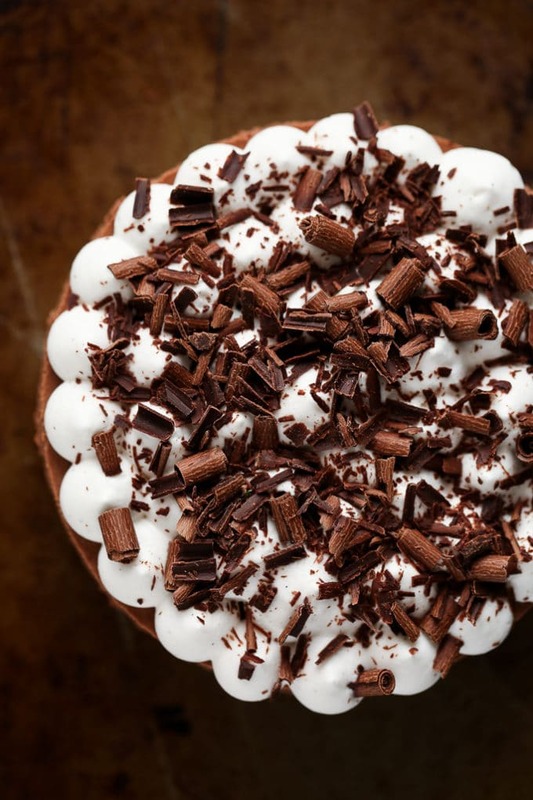 This pie’s light, fluffy texture is perfectly complemented by its rich chocolate flavor, meaning it hits the sweet spot without necessitating an immediate dessert-induced wardrobe change into roomy yoga pants. In case you were wondering, I have a post-dessert wardrobe change nearly every evening. I can’t help it, dessert loving is in my genes. Every member of my mom’s side of the family jokingly claims to have a second stomach solely dedicated to dessert. I might have chalked that proclamation up to frivolous exaggeration had I never witnessed them around a perfectly-frosted birthday cake. 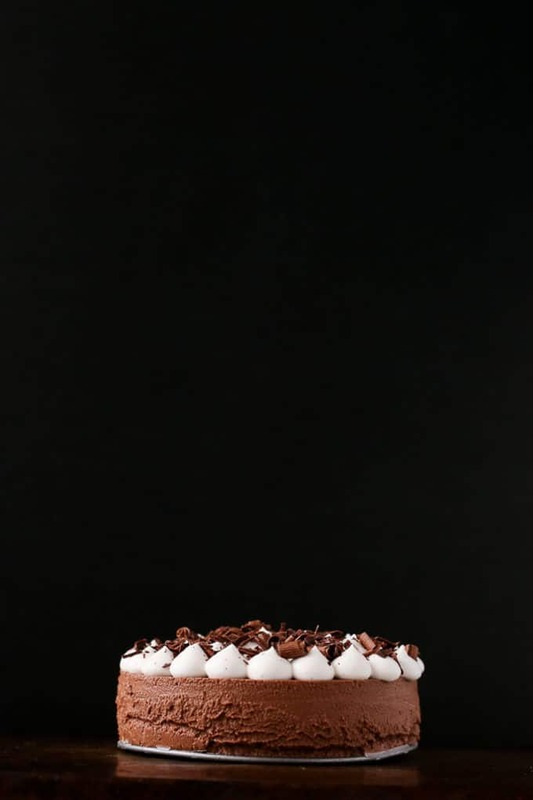 It’s a miracle if a cake can make it to candle time unscathed, because there’s typically a wandering finger that finds its way to the frosting and “accidentally” scrapes across the surface, procuring a hefty mound of the good stuff for whomever was bold enough to attempt it. I have a feeling this vegan french silk pie would indeed be lost to the full swipe of someone’s palm if it were brought to a Harty family gathering. 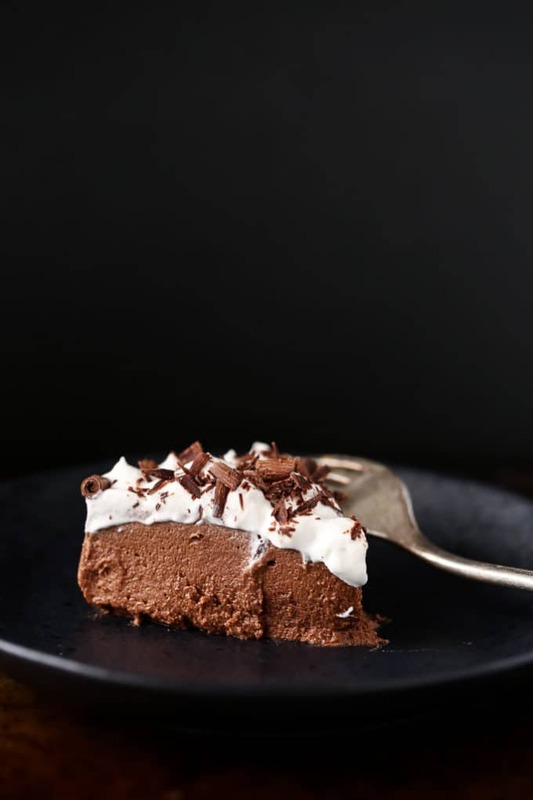 To make this vegan french silk pie, you’ll start by melting down 1/3 cup of raw cacao butter in a double boiler or bain marie. Cacao butter is the cold-pressed oil from the cacao bean, and although it sounds unusual and mysterious, it’s actually one of the main ingredients in something most of us eat on a fairly regular basis: chocolate. At room temperature it resembles white chocolate but melts down to a clear, golden liquid. While the cacao butter melts, you’ll open a can of full-fat coconut milk (or unsweetened coconut cream), pour off the watery liquid (or reserve for another use), and scoop 1 cup of the thick cream into a mixing bowl, reserving the remaining 1/2 cup of cream for the top layer. Then, use a hand or stand mixer with whisk attachments to whip the cream for 3 to 4 minutes or until it becomes fluffy with stiff peaks. By now, your cacao butter should be just about melted. Once it is, you’ll add in some raw cacao powder, which is the unprocessed version of cocoa powder. I’m only explaining because it gets a little confusing with all of these cacaos involved. Crazy cacaos. You’ll also add in a bit of pure maple syrup and a tiny pinch of sea salt. 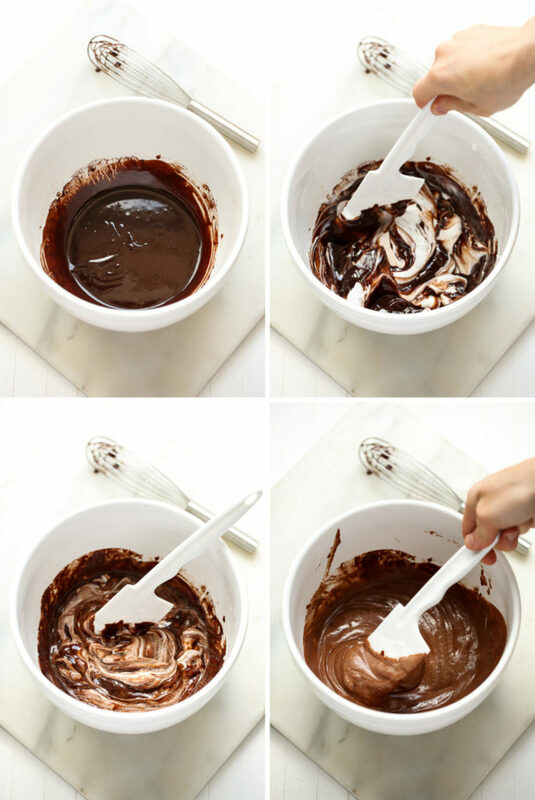 Then, whisk until you have a smooth liquid chocolate (see top left image in collage below). Then, you’ll pour that airy chocolate mousse into a 5-inch greased springform pan, and pop it in the fridge to set for at least 4 hours but preferably overnight. 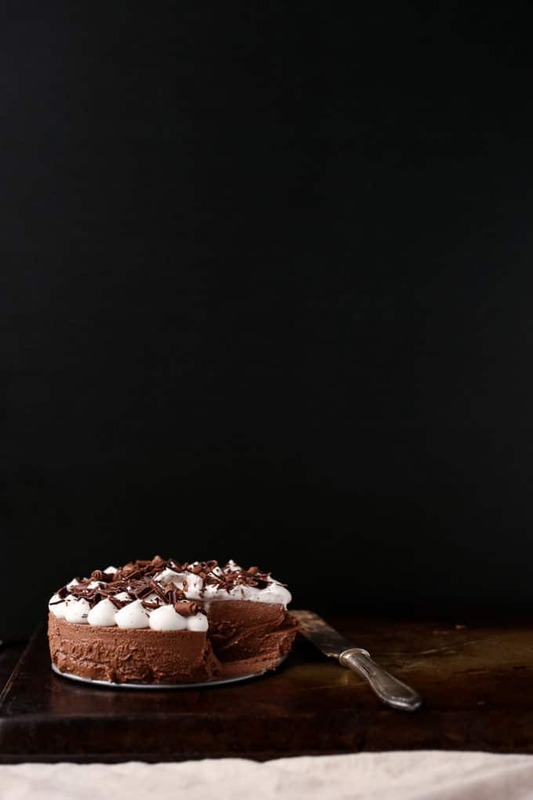 While the chocolate mousse layer is setting, you’ll make the coconut whipped cream layer by scooping out the remaining chilled coconut cream from the can (it should be about 1/2 a cup, but you may want to have an extra chilled can on hand just to be safe). Add the cream to a mixing bowl along with a tiny drizzle of pure maple syrup, and use a hand or stand mixer to whisk the cream for 3 to 4 minutes or until light and fluffy. 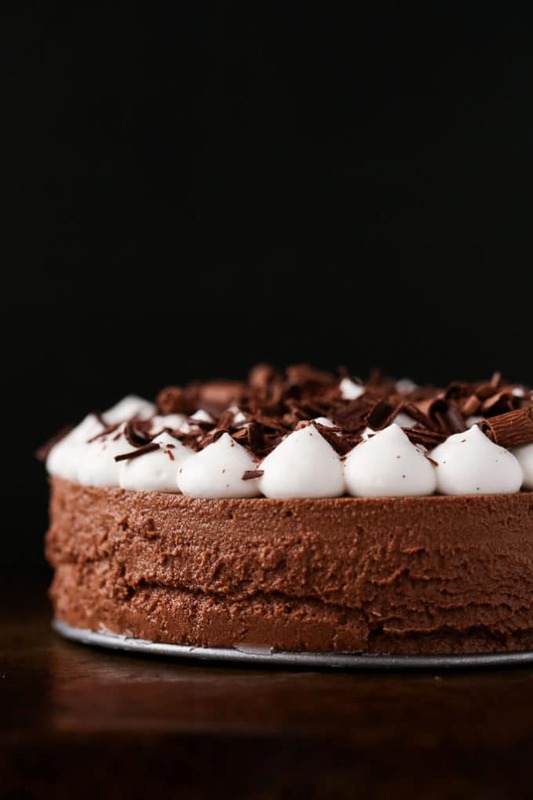 Once the chocolate mousse layer has set, spread or pipe the coconut whipped cream on top. Then, sprinkle with shaved dark chocolate. If you want to make this a 4-ingredient vegan french silk pie (salt excluded), then you can make your own chocolate at home using a bit more cacao butter, cacao powder, and pure maple syrup (see recipe notes). The only thing left to do is slice, serve, savor, and repeat. Again and again. And again. If you make this decadent little pie, be sure to snap a photo and share it on Instagram + tag it #blissfulbasil so I can check. it. out. 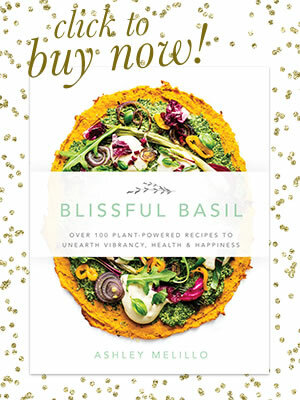 Note: I know that just about every food blogger is asking the same favor lately, and I’ve held off on jumping on board BUT I’ve noticed that a lot of you tag @blissfulbasil — which is awesome, keep doing that too — but also make sure you add #blissfulbasil to your caption otherwise the photo won’t show up in a search. That means I end up missing a lot of your awesome photos, which bums me out because I love stalking looking at/commenting on them. Alright, end social media plug, resume pie ogling. 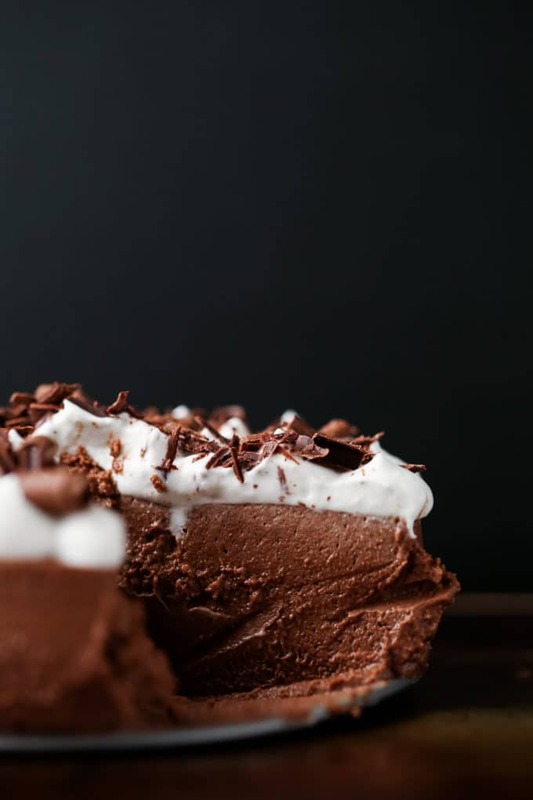 Just 5 ingredients stand between you and this rich, decadent, and cloud-like vegan french silk pie. If you make your own chocolate at home, the ingredient list actually drops to 4. To make it, you'll melt raw cacao butter in a bain marie or double boiler. As the cacao butter is melting, you'll whip chilled coconut cream until its fluffy and whipped-cream like. Once the cacao butter is melted, you'll whisk in raw cacao powder, pure maple syrup, and a dash of sea salt until smooth. Then, fold in the whipped coconut cream. Pour it all into a 5-inch springform pan and refrigerate for at least 4 hours but preferably overnight. Then, whip up a bit more coconut cream, spread or pipe it over top, and sprinkle with shaved chocolate. Perfection. Meanwhile, in a medium mixing bowl, combine the remaining chilled coconut cream (it should be about 1/2 cup) and maple syrup. 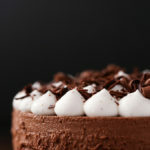 Using a hand or stand mixer with whisk attachments, whisk the cream on high for 3 to 4 minutes or until thick and fluffy. Scoop into an airtight jar or container and refrigerate until ready to assemble. Once the chocolate mousse layer has set, carefully open the springform pan, leaving the bottom intact, and transfer the "pie" to a serving plate. Then, use a pastry bag to pipe the coconut whipped cream on top OR spoon it on top and use a metal spatula to gently smooth it out. 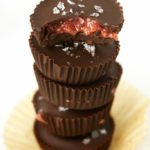 Garnish with shaved dark chocolate, slice, and serve. Store in refrigerator. *Since writing this recipe in 2015, many brands of coconut milk and coconut cream have modified their ingredients to include additives and stabilizers. Unfortunately, in many cases, this can cause the coconut milk to curdle or fail to whip up properly. Thai Kitchen was long one of my favorite brands; however, I've had terrible, terrible luck with their coconut milk as of late. It curdles when whipped. For a long while, Trader Joe's coconut cream was giving me the same troubles; however, they recently modified their organic canned coconut milk and organic coconut cream to simply contain coconut and filtered water. Fingers crossed, but thus far, I've had great success using their coconut cream to make whipped cream. Hope this helps and enjoy! **Make your own dark chocolate by melting another 1/4 cup cacao butter in a bain marie or double boiler. Then, whisk in 1/4 cup cacao powder and 1 to 2 tablespoons pure maple syrup. Pour into a mold or cupcake liners and refrigerate for 1 hour or until set. 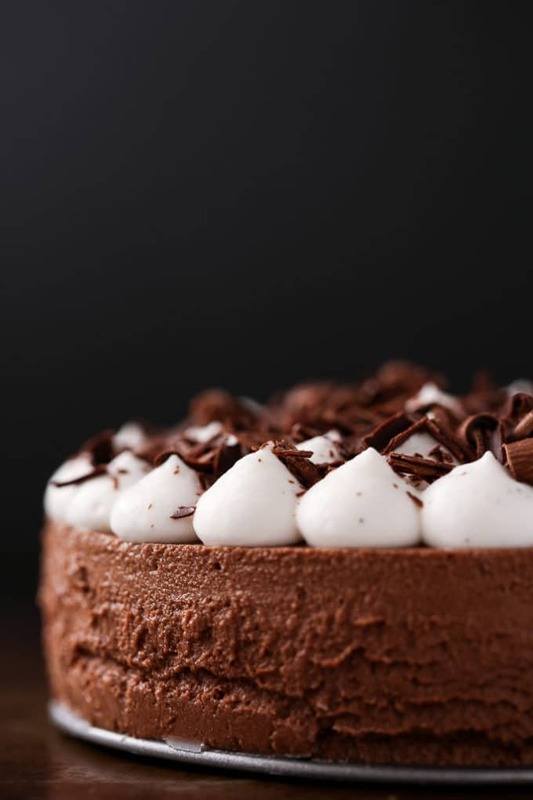 ***The total time does not include chill/set time for the chocolate mousse layer, so make sure you read through the instructions first and take that 4+ hour time period into account. Thanks, Rebecca!! I hear you on the chocolate. WOW! This looks amazing. 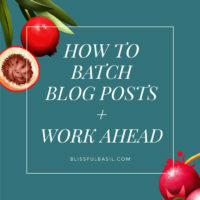 You have inspired me to get back on my blog and start creating again! This looks really incredible! Where do you get cacao butter? Whole Foods? I haven’t seen it at my usual grocery stores or maybe I’m not looking in the right section. There was a recent sale on coconut milk so I have some at home that would be perfect for this :) Thanks for sharing such a great recipe!! Can’t wait to try it! Thanks, Meghan! You can find cacao butter at Whole Foods but it’s pricey ($8/2 ounces or so), so I buy mine through Amazon (http://www.amazon.com/dp/B004I8G6JE/ref=sr_ph_1?m=A216LHO9N19DU1&ie=UTF8&qid=1436988995&sr=1&keywords=cacao++butter). 1 pound lasts me 6 months to a year depending on how often I’m using it, and the chips are easy to measure out. It’s about 1/4 of the price of the kind they carry at Whole Foods. I hope this helps and that you enjoy the recipe! Looks amazing! Wondering if instead of making your own coconut whip with the canned coconut milk, if you could use the premade cocowhip from whole foods? Hi, Kayla! 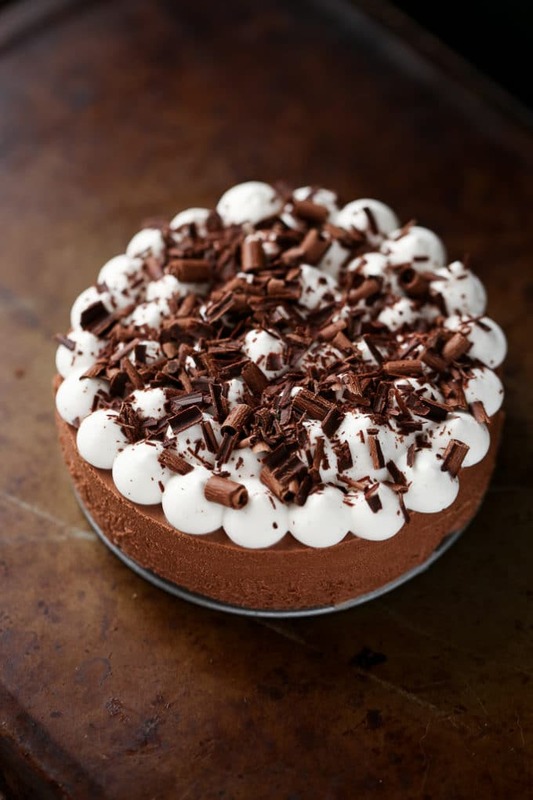 You could absolutely use that for the topping, but I would stay away from using it within the chocolate mousse layer as I’m not sure how the gums and stabilizers in it would affect the texture and setting of the mousse. If you do happen to try it, I’d love to know how it goes! On a more serious note, though, where do you buy your cacao butter and powder? I live in the middle of nowhere, so our local stores won’t have them. Do you get them on Amazon? Please and thank you! I usually purchase cacao powder and cacao butter through Amazon. Although both can be found at Whole Foods, I’ve found that it’s much more affordable to purchase them through Amazon. I hope this helps and that you enjoy the pie! OMG that looks incredible! I love your photos here, totally drool worthy :) Even better that it is so easy!! Thanks so much, June! It’s always so nice to hear from you. I hope you’re doing well and enjoying the summer! Woah. Love it. I have been looking for an easy dessert and while this may be time consuming, I think I could pull it off. Looks simply gorgeous! This looks like a piece of art and delicious as well. I can’t wait to try this. Thanks so much, Consuelo!! I hope you have a chance to try it. It’s richly chocolaty in the best of ways! This is so beautiful, and I love that it’s dairy free! I just put the cacao butter and powder in my carts! Thanks for the recipe, can’t wait to try it! Thanks, Caroline! So happy to hear you’re giving it a try. I hope you enjoy it, and I’d love to know what you think once you’ve made it! Wow! 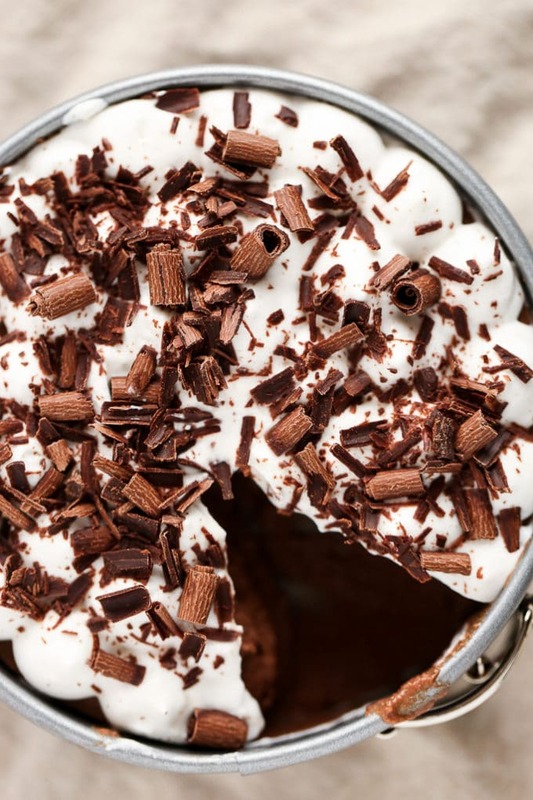 This is creamy dreamy chocolate pie perfection! I am soooo in love with coconut whip and have been using it like crazy in desserts lately too. So your pie is definitely going to happen here. And it will be just me chowing it down (my bf doesn’t like chocolate!?!?!? so it’s always just one one one with anything chocolate around here for me) and that is perfectly okay with me! WHAT?!! Doesn’t like chocolate?! I think he needs to spend a week with my family :) Although, there are definite perks to that arrangement. I think Dan and I had our first official “fork fight” while leaning in for the last bite of this the other week. I am really excited to make this! Do you think it would be ok if I made a simple syrup out of coconut sugar to replace the maple syrup, low glycemic people here. Your photographs are lovely and NEAT. Because messy food photography hurts my OCD bone, I want to say THANK YOU for making clean food photos look so gorgeous. 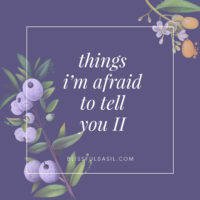 I’m giving you a shout-out on my blog. Haha, no worries!! It gets me all the time too. 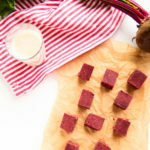 The cacao butter doesn’t have to be raw (I’ll make a note), but the one I use is so I tend to write it in recipes that way out of habit rather than necessity. I hope you enjoy this treat!! Hi Tracie! Thanks for taking the time to share your feedback and adjustments. It should not be at all grainy, but this can occur if the cacao butter is overheated during melting which is why it’s so important to only heat it until just melted. The first time I tested this recipe, I accidentally overheated it and the same thing happened. After a little research and two more (smooth, non-grainy) trials, I realized it was the cacao butter. Also, did you use a spatula to gently fold the chocolate into the cream? Beating it with a mixer can also cause a grainy texture. I hope this helps, and I’m so glad you’re enjoying the flavor! Thanks Ashley, I think I probably did over cook it. After the cacao butter chunks melted I poured it into a measuring cup and saw that I didn’t have enough so added more and over cooked the rest I am sure. I will try it again, can’t wait. Can I use melted coconut oil instead of the cocoa butter? Hi, Sarah! Cacao/cocoa butter sets up much firmer than coconut oil, so I have a feeling it wouldn’t set as airy and mousse-like with coconut oil. Cacao butter also adds to the chocolate flavor, so the flavor would be a bit more coconutty (totally not a word, but I’m going with it) rather than chocolaty. I don’t think it’s so far off that it wouldn’t be worth a try, but I definitely think it would be different. If you do give it a try, I’d love to know how it goes! As an aside, if you’re having trouble finding cacao butter (or at a reasonable price), I recommend purchasing it through Amazon or another distributor. I used to buy cacao butter at Whole Foods for something like $8/2 ounces, but that’s crazy expensive compared to online prices which are around $16 for 16 ounces (16 ounces lasts me 8 months or so and that’s with lots of recipe testing, but the brand I buy says it keeps well for up to two years)! I hope this helps! I stumbled across this on Pinterest somehow and WOW. Seemed risky to do on a first attempt, but I made it for my husband’s work party — it was a big hit. This is the single best dessert I’ve ever made. I did have a little trouble with the texture after the folding (the chocolate mixture cooled before incorporating so is was closer to chocolate flecked whipped cream (likely because I quadrupled your recipe and put it in a 10″ springform)), but I thought you can’t really over mix and it’s going to set up in the fridge no matter what I do, so I gently melted the whole thing down and whipped it a few times with my hand mixer — success! SO smooth! Put a chocolate cookie crust under it (cashews, dates, shredded coconut, cacao, food processor, etc.) and perfection. 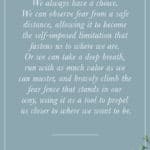 I will make this a hundred more times (and anyone who happens to read this should too). THANK YOU! Laura!! Best dessert you’ve ever made?! Thank you, thank you, thank you for this awesome feedback! I’m happy to hear it came out smoothly, especially quadrupling it. Also so glad it was a hit at the party. Thank you for taking the time to share your feedback! Hope you have a wonderful holiday season! 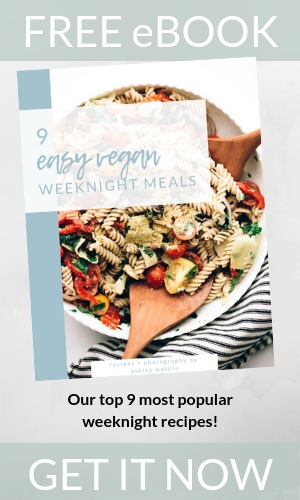 Hi Ashley, this recipe looks too good to be true. 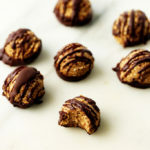 planning to make it for christmas dinner, could I maybe substitute cocoa butter for any nut butter, what do you think? Thank you! Cacao butter sets up completely solid, so it’s a necessary part of this recipe. If you used nut butter, it would probably end up more like a runny pudding. I’m sorry — I know this isn’t much help! You can find cacao butter online for a fraction of the price that it’s found in stores. I usually buy a 1 pound bag for $16 dollars and it lasts me an entire year (and I use it often — every other week usually). I hope this helps! I was wondering if you happen to have nutritional # facts on this? Would help for those who count their # intake. Hi, Teri! I’m so sorry, but I don’t include nutritional information for a variety of reasons (my facts page has more information if you’re interested). I know there are lots of online nutritional calculators though and you should be able to transfer the ingredient list directly into one if needed. Hi, Grace! It’s definitely a good question. The reason for the cacao butter, powder, etc. 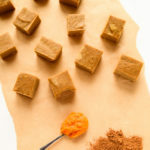 is to have precise control over the texture and the way it sets as chocolate bars tend to vary in terms of how much they contain of one ingredient or another. You can certainly try it with a chocolate bar or two, I’m just not sure of the exact amount you’ll need. If you search for my 4-ingredient chocolate mousse, that should give you an idea but I would use more chocolate to increase the density. I hope this helps! How could this be turned into a cartoon pie? Coconut oil and carob powder? I think most cacao powder is raw but you can certainly use non-raw. I haven’t tried making this with cocoa powder, so I’m not sure how it will turn out. 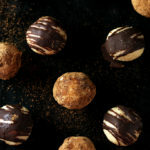 One thing to note if you try it is that the chocolate flavor will be much softer with cocoa powder, because cacao powder offers a richer and more intense chocolate flavor. I definitely do not recommend substituting butter, as it will not set properly without the cacao butter (which is hard at room temperature). I was wondering if it would be ok to use coconut palm sugar instead of maple syrup? Hi, Isabel! I’ve never tested the recipe with that swap, so I can’t say for certain but I wouldn’t recommend it. Have a feeling it would yield a gritty texture. Thank you for such a prompt reply! I also wanted to ask you, what is the amount of cacao butter needed in grams? Hi, Isabel. I don’t have the gram measurement but it should be 1/3 cup roughly chopped cacao butter chunks or discs. Hope this helps and enjoy! Hello I am trying to make this for my family for thanksgiving I want to make it in a 9 inch round pan should I just double up the ingredients to get the desired look? Hi, Trisha! A 9-inch springform pan has just over triple the area of a 5-inch, so you’ll want to triple the ingredients to accommodate the adjustment. Hope this helps and enjoy! I failed. I’m so sad, I couldn’t get the coconut cream to thicken to the consistency of whipped cream. Oh no! Which brand of coconut cream did you use and was it straight coconut cream or did it have added stabilizers or gums? Unfortunately, more and more brands are adding extra junk these days and it makes coconut cream unreliable (especially for whipping as it either stays watery or curdles). I’m so sorry. I’m going to add an updated note to the recipe because this problem seems all too common these days. Made this so my GF, DF family members wouldn’t get left out of dessert time and it far surpassed my gluten/dairy-loving self’s expectations! It’s creamy and rich and not overwhelmingly sweet plus major bonus points for being able to make it ahead, perfect for a dinner party. My chocolate mixture did get a little grainy when I folded in the coconut even though I thought I was really careful not to overcook the cacao butter. I don’t think it made a difference in taste so it wasn’t a big deal. 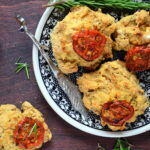 Thank you for this wonderful and easy recipe! So happy to hear you and your family enjoyed it, Lauren! Thanks for taking time out of your day to come back and share your thoughts—means a lot to me and is helpful for others, too. Happy New Year to you! Hi! I was wondering if you were able to find all listed ingredients at Trader Joes? My husband is going to make this for my birthday and I want to make it as easy as possible on him lol. Thanks! Hi, Chelsea! How sweet of your husband! Our Trader Joe’s doesn’t carry cacao butter so I typically order it online from Amazon. I believe they have all other ingredients.